Yesterday’s post—the update on questions—begs a follow-up: an update on imagination. Before Martin was diagnosed, when we were investigating local preschools, Adrian and I spent twenty minutes in a Montessori classroom for three-through-five-year-olds. There I observed one boy, probably a three-year-old, engaging in several minutes of independent pretend play. He found a cloth square and an empty bottle and employed both to “clean” a mirror, swishing back-and-forth, examining his work and checking (I assume) for smudges, then re-polishing the spots he’d “missed.” It impressed me, to see him working so hard at an imaginary task. I recall thinking, Gosh, Martin doesn’t play like that, and then telling myself, Give him time. Almost 18 months have passed since we visited that Montessori classroom, and Martin still doesn’t play like that. (And now, of course, I believe that the answer lies with intervention, more so than with time.) Imaginative play, it seems to me, does not emerge spontaneously from the linear thinking of an ASD kid. At least, imaginative play in the traditional, “creative” sense does not emerge spontaneously; on the other hand, I’ve seen many examples of quasi-imagination in ASD kids and adults, in terms of viewing problems or issues in unexpected ways. Martin may be turning a corner in this arena, too. Over the past four days, I have jotted down four instances of Martin apparently using his imagination. If someone had told me, two years ago, that I would grab a sheet of paper to make a note every time my son shows imagination, I would have scoffed. No scoffing today. Neural repair happens brick by brick by brick by brick, and it’s important to keep track of what’s being laid where. 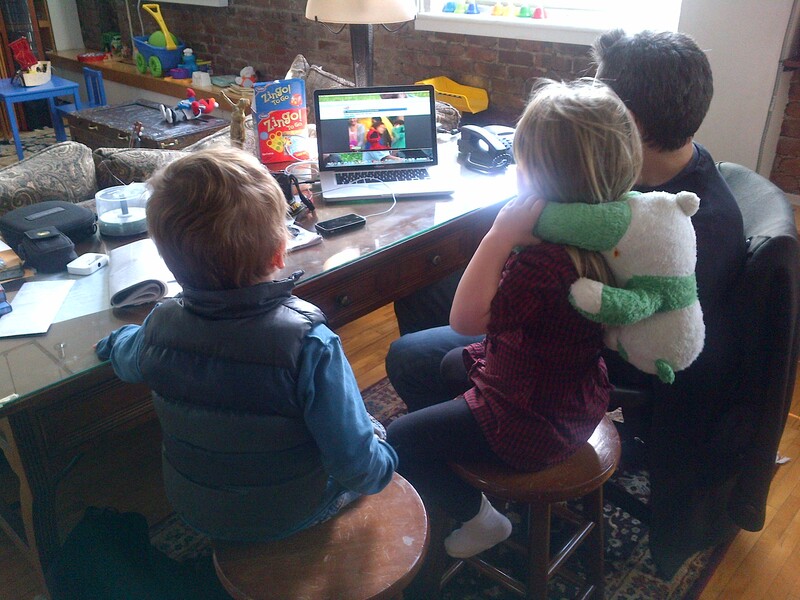 Martin, checking out some videos with his cousin and Adrian. Martin doesn’t ask questions yet. Questions are non-linear language, and (as I’ve discovered) they are complex. So far, Martin uses only imperative and declarative speech. For example, if he can’t find his flute, instead of asking, “Where’s the flute?”, he repeats, “I want the flute. I want the flute,” until someone helps him find the flute. I don’t really count those requests as questions, per se, because they are (1) scripted and (2) not seeking information. In the past week, I’ve witnessed the first glimmers that we might be turning the corner (and I hope I’m not getting ahead of myself). Tuesday, as he and I were walking together, Martin spotted a jet in the sky. “A plane!” he blurted (as usual), pointing (a newer development). I replied, “I see it, too.” Then Martin said, “Where is the plane going?” I’m not certain Martin was really looking for an answer; he seemed almost uninterested even while inquiring. And I wondered whether, “Where is the plane going?” wasn’t a scripted question, repeating part of a school exercise. Nevertheless, I made a big deal of responding. Saying I wished I knew. Observing the size of the plane and guessing the possible destinations. Trying to make Martin feel rewarded for (possibly) asking a question. I’ll report on more questions as they come. I’m looking forward to a day when Martin asks questions non-stop, at which time I’ll post on the topic How Do I Shut My Kid Up? Last weekend my law-school roommate, who lives in New Jersey, brought her daughter, Mieko, over to play with Martin. Mieko is five months older than Martin, and the most wonderfully bossy little girl, and one day she’s going to marry Martin. I’m quite confident of this; I’ve been planning the wedding since Martin was born. It was great seeing you, Adrian, and Martin yesterday. I wanted to tell you something in the car and didn’t get a chance to. I remember you told me a while ago that Martin could not participate in a kiddie gym class because he was not able to follow what the other kids were doing and would go off and do his own thing. Well, yesterday, I noticed that that was not an issue for Martin anymore. Remember when we were having our jam session? I was on acoustic guitar, Mieko was on electric guitar, you were on tambourine, and Martin was on harmonica. He was definitely aware that we were all playing music together. Not only was he aware that we were having a jam session, but he also noticed a certain someone (Adrian) who was off doing his own thing and was not participating in the group activity! He then proceeded to pull over Adrian to the piano so that everyone was participating together! What was impressive was that we weren’t all doing the same activity, like everyone hopping on one foot or everyone clapping hands. All of us were each doing something different with different instruments, and yet Martin recognized it as a coordinated activity where each person, doing something different, was together working toward the same goal of creating music. So playing the piano was acceptable to him, but looking at the computer screen was not. I am no expert on child development, but doesn’t that require an awareness of others at a level that three-year-olds don’t always have? Anyway, the jam session was very fun and very cool! I take issue with only one part of this message: With twin seven-year-old sons at home, plus Mieko, my roommate by now is an expert on child development. And that makes what she wrote all the better. 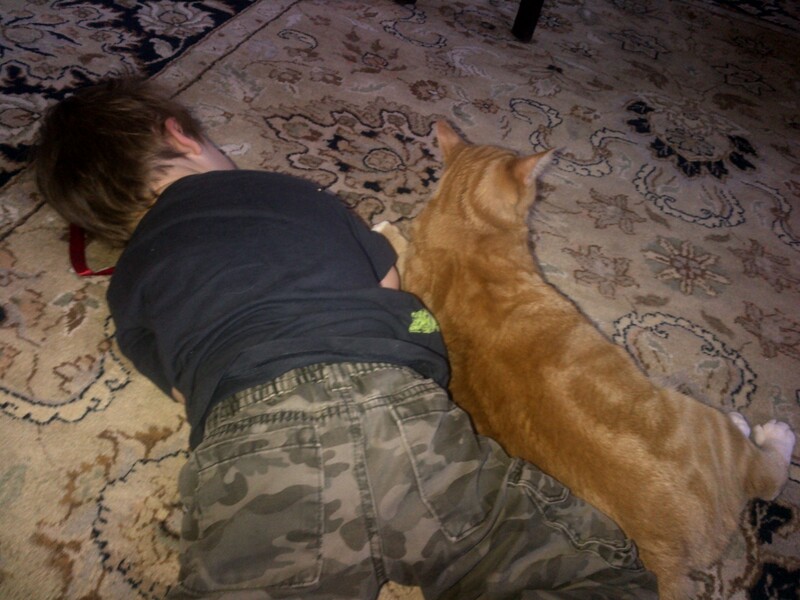 A boy and his cat. Martin and George, tuckered out from a hard day of playing with friends. The week before last I posted about what’s disappeared: lethargy, toe-walking, aimless drifting, low muscle tone, sleep problems, clumsiness, and most of Martin’s echolalia. Those are all behaviors that Martin used to have, that he no longer has, and that popped immediately to mind when Adrian and I were discussing treatment costs. Not long after publishing that post, I was walking home from Martin’s school, pondering his progress, when I remembered “transitioning.” It was a slap-my-own-forehead moment, like, Oh yeah! Transitioning! Until mid-summer 2011, transitioning—i.e., the ability to stop an activity and begin another—had been one of our biggest concerns. Martin’s teachers at his old school mentioned it constantly; moving from the gym back to the classroom prompted a tantrum, as did moving from circle time to table work, or music to snack. We experienced the challenges at home, too. I needed only mention bedtime or going out or a visitor’s arrival in order to upset Martin. Martin (like most any toddler, I imagine) still has trouble leaving the playground or his best friend’s house. (A five-minute countdown helps. “Martin, in five minutes it’s time to walk home. Five minutes.” Sixty-second pause. “Martin, in four minutes it’s time to walk home. Four minutes.” And so forth.) It’s been months, however, since straightforward change of activity posed problems. With a little more consideration, I’ve come up with other issues so far gone that they didn’t make the initial list of what’s disappeared. Bolting, for example. I can remember a time when I could not pause to greet a neighbor, because Martin would be half a block away within seconds, never once looking back to check his mother’s location. Now, unless he’s really engrossed in a sandbox or something, Martin makes eye contact even from across a playground, keeping tabs on me. Not quite as close tabs as I keep on him, but still. The inability to sit. I went months without being able to listen to a sermon in church. I was too busy pulling Martin out from under the row in front of us, or chasing him down the aisle, or retrieving him from whoever’s personal space he’d invaded. Last Sunday I heard every word of the sermon, relaxing with my arm around the shoulders of Martin, who was flipping the pages of a book. Injuring himself. For a time bruises appeared on Martin so constantly that I stopped trying to track their sources. He banged into furniture, fell because he wasn’t watching his step, shook his head so fiercely that he smacked it into walls, tipped chairs over while attempting to arch his back enough to see behind him. Today, if there’s a bruise, there’s an identifiable cause. Adrian says sometimes that a day will come when this whole chapter will be a distant memory. I’m working on sharing that dream. Twenty years from now Martin will be playing U.S. Open tennis, or making his debut at the Met, or accepting a Rhodes Scholarship, and I’ll smack my own forehead and recall, Oh yeah! Autism!